The low-yield environment may limit the return potential of traditional fixed income portfolios, while downside risks could be substantial should interest rates rise. However, there is a broad $6.5 trillion opportunity beyond core fixed income that may generate an attractive level of income and help manage interest rate risk and portfolio volatility. Following the financial crisis, interest rate risk for certain traditional assets has increased. Harder-to-access areas of the credit market may be less impacted by changes in interest rates compared to traditional fixed income investments. Finding low-correlated assets, or assets that do not move in relation to one another, is difficult in today’s environment. However, harder-to-access areas of the credit market have historically exhibited low correlation to traditional fixed income investments. Diversification does not protect an investor from market risk and does not ensure a profit. The benchmarks are shown for illustrative purposes only. An investment cannot be made directly in an index. While core fixed income investments can be accessed through low-cost passive strategies, many less-liquid and more-complex areas of the credit market require a skilled manager. An active manager with the flexibility to invest across the credit markets may help identify and invest in attractive opportunities beyond the scope of traditional “core” fixed income investments. This broad, multi-sector approach may help generate income and diversify a traditional fixed income portfolio. Bloomberg Barclays U.S. Aggregate Bond Index is a broad-based benchmark that measures the investment grade, U.S. dollar-denominated, fixed-rate taxable bond market. Duration is a measure of the sensitivity of the price of a fixed-income investment to a change in interest rates, expressed as a number of years. Structured products may include, but are not limited to, collateralized loan obligations, residential mortgage-backed securities and other asset-backed securities. 1 Differentiated sources of income refers to non-core fixed income investments (including, but not limited to, emerging market government debt, high yield bonds, emerging market corporate debt and structured products). 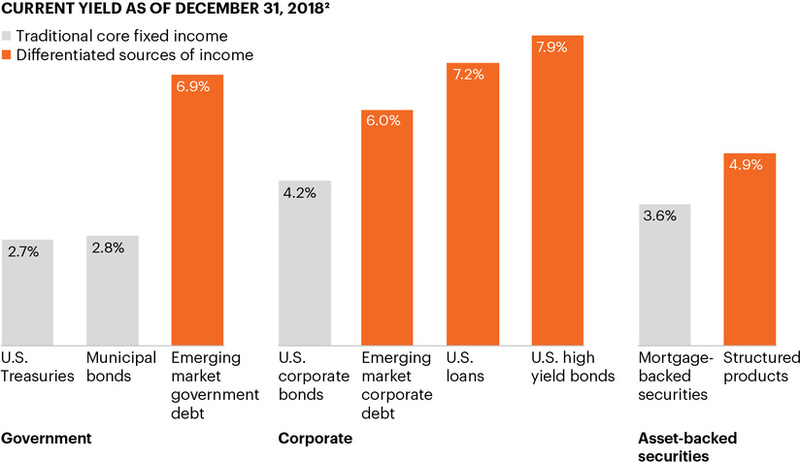 The yield of these investments may be higher than those of core fixed income investments (including, but not limited to, U.S. Treasuries, investment grade corporate bonds and U.S. municipal bonds). Investing in non-core asset classes may carry increased risks as compared to core fixed income assets, including credit risk and liquidity risk. 2 Bloomberg. As of December 31, 2018. U.S. Treasuries are represented by the ICE BofAML U.S. Treasury Index. Municipal bonds are represented by the ICE BofAML U.S. Municipal Securities Index. U.S. corporate bonds are represented by the ICE BofAML U.S. Corporate Master Index. Mortgage-backed securities are represented by the ICE BofAML U.S. Fixed Rate CMBS Index. Emerging market government debt is represented by the J.P. Morgan EMBI Global Index. U.S. loans are represented by the S&P/LSTA Leveraged Loan Index. 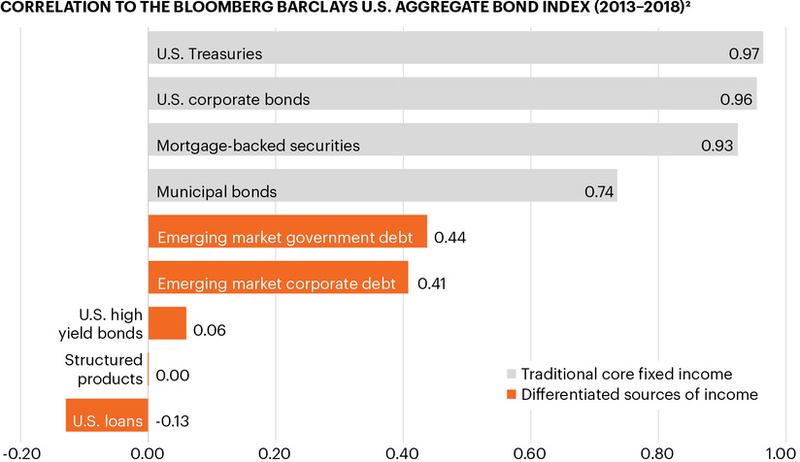 Emerging market corporate debt is represented by the J.P. ﻿Morgan CEMBI Broad Index. U.S. high yield bonds are represented by the ICE BofAML U.S. High Yield Index. Structured products are represented by the J.P. Morgan CLOIE Index and Clarity Solutions Group, LLC. This information is educational in nature and does not constitute a financial promotion, investment advice or an inducement or incitement to participate in any product, offering or investment. FS Investments is not adopting, making a recommendation for or endorsing any investment strategy or particular security. FS Investment Solutions, LLC is an affiliate of the investment advisers to FS Investments’ funds and serves or has served as the dealer manager for certain of the public offerings of shares by FS Investments’ funds.